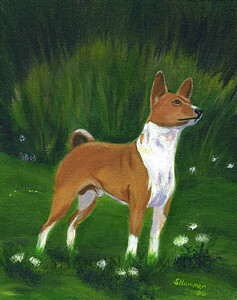 "Portrait of A Basenji" © 2006 By Sharon Nummer Acrylic on Canvas Original painting sold. 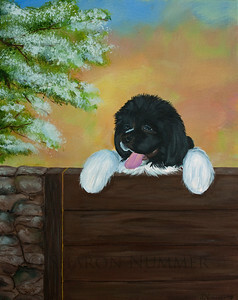 "Hello Everybody" © 2010 By Sharon Nummer Acrylic on Gallery Wrap canvas. Original painting is available. "Hanna's Bumper" © 2006 By Sharon Nummer Acrylic on Gallery Wrap canvas Original painting is sold. Trick Or Treat" © 2006 Acrylic on Panel. Original painting is sold. 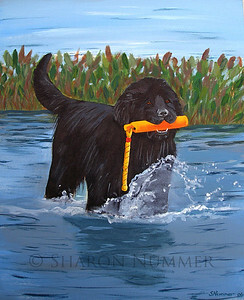 "Beach Patrol" © Sharon Nummer Acrylic on Gallery wrap canvas. The original is in a private collection. Prints available. 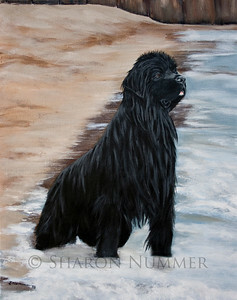 This painting is a reminder of a beautiful day spent with my Newf, Watson on a very small beach on Lake Michigan. Watson is watching all the swimmers. His concern is so evident on his face. He swam out to each person and herded them to shore. 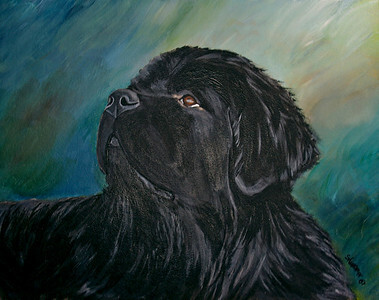 Watson was following the natural instincts of a Newfoundland dog..to rescue swimmers. 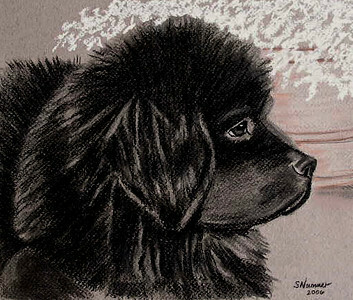 "Baby Newfie" © 2006 Sharon Nummer Charcoal Drawing on Tiziano paper. This is one piece I wish I hadn't sold. This is one of my very favorite pieces. The Newfie puppy is my little boy, Watson. I took the photo from which this drawing was created when he was 12 weeks old. I have reproduced this drawing on a variety of merchandise. Looks lovely on a ceramic tile. 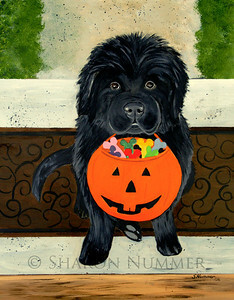 "Young Newfoundland" © 2007 Sharon Nummer Watercolor on Strathmore Cold Press Illustration Board Here is a painting I can't sell. The Newfoundland is my boy, Watson at 2 years old. His gentle and intelligent expression is so dear to my heart. Prints, cards, and other items available. 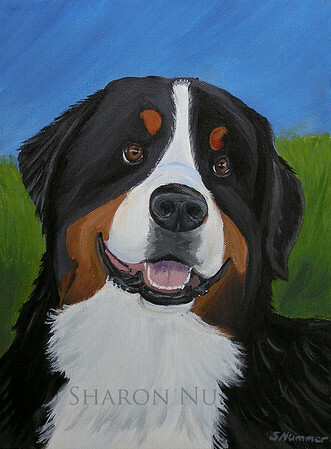 'Portrait of a Bernese Mountain Dog" © Sharon Nummer All rights reserved by the artist. 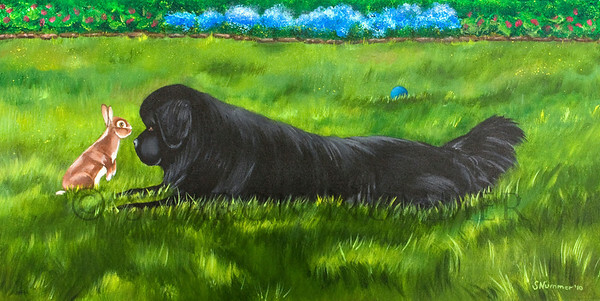 Acrylic painting on canvas I met this sweet boy at a dog show. His engaging personality was something I wanted to capture on canvas. The original has been sold. 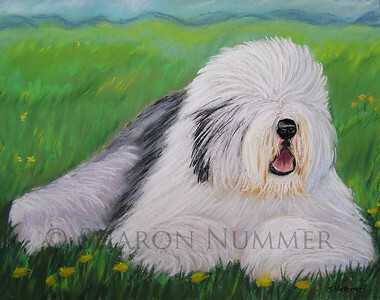 "Summer Afternoon" © Sharon Nummer Pastel on Paper Old English Sheepdogs are one of my favorite breeds to paint. This beautiful dog was waiting to go into the ring. I loved the colors of his coat, particularly the black flecks on his head. I wanted to bring out the textures of his coat using pastels. The original painting is sold. 'Portrait of a Bernese Mountain Dog" © Sharon Nummer All rights reserved by the artist. I met this sweet boy at a dog show. His engaging personality was something I wanted to capture on canvas. The original has been sold.